During the summer of 2017, I went back to Beijing. The different perspective on freedom between China and United States almost works as a reverse culture shock on me. My parents had a hard time accepting my new appearance, especially my long hair. 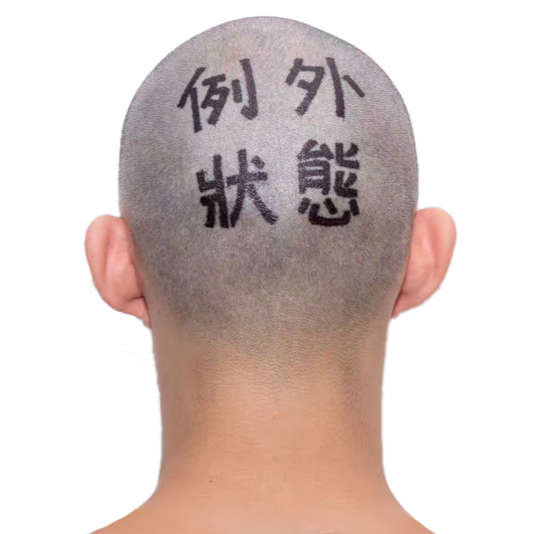 Beginning from the Head is a performance that I wrote “Status of Exception” in Traditional Chinese on my head, after I shaved the hair I grew while I was in United States. It is also worth pointing out, through Chinese history, short hair as an identity for masculinity is only a trend in recent decades. Before modern era, Men never cut hair after adulting. And shaving is a major offense to the family. This work focuses on personal expression gained a lot of resonances among people experiencing similar culture changes.